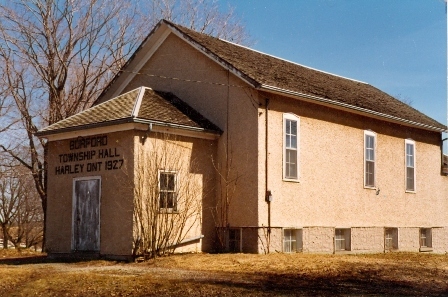 The Burford Township Historical Society will be hosting an Open House at the Harley Museum this Saturday, February 25th, 2012, from 11 am to 3 pm. Harley is the name of the little hamlet just to the west of Burford (which makes it part of our Brant County family). This is not a motorcycle museum by the way. Come and hear why the local residents are still miffed at the Americans for their dirty deeds during the War of 1812…. Also learn about the Battle of Malcolm’s Mills and more. The BTHS was founded in 1986, and one of its founding members, Clayton Barker, will be on hand to answer questions and explain the significance of items in the Museum’s collection.